Prayer is the fundamental of the Christian life and the time in prayer can be rewarding. This e-book will help maximize your prayer and devotional time. 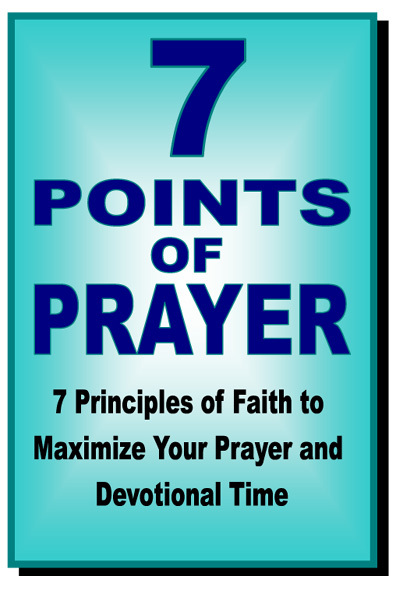 Learn how the 7 Points of Prayer can help you in your daily life, family relationships work and business. These "Points" or principles are not only to be read but also implemented in your devotions and help readers to have a deeper, more spiritual life and find success in other areas of life. Chapters Include subjects on: Forgiveness, Creativity, Wisdom, Love and More! On Forgiveness (Chapter 2): Prayers for forgivness relies on us to not only seek its redemptive power from our Heavenly Father but also within ourselves. If our Saviour can forgive us than we ourselves must forgive OUR own mistakes and sins. Not carry it around. Not let it destroy our lives. If we cannot forgive our own self than we cannot find it within our hearts to forgive others and find peace of mind. Release Date: SEPTEMBER 24, 2013 - An email of The E-Book will be sent to the address provided.